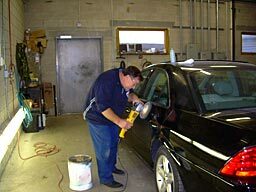 In the Detail Shop, we perfect your new paint finish and prepare your vehicle to be returned to you. Here, we carefully hand-polish your new paint to remove smooth the finish and match it to adjacent panels. Then we buff the finish to the desired gloss. Any moldings or emblems that were removed for your repair are now re-installed. Then we wipe down your vehicle's interior, wash the exterior, clean the windows and shine the tires. Your vehicle leaves Lamon Auto Body looking its best.